no joke, but apparently MoDOT wants to rip out the broadway bridge and build a new one. presumably they'll tout better bike/ped access, in exchange for more lanes and better interchange with I-35/70. i can't imagine this happening without the taking of private property. I could see making a deal to not oppose this in exchange for train crossing money. not the perfect situation, but one to take advantage of. as for ped access. really? it goes to Harlem, the Airport and ??? Last edited by flyingember on Fri Oct 11, 2013 1:49 pm, edited 1 time in total. Last edited by pash on Thu Feb 09, 2017 6:12 pm, edited 1 time in total. pash wrote: This would almost certainly worsen rather than alleviate the freeway dead zone in the area. Somebody tell MoDOT to start figuring out how to clean up the mess it's made. Can't do it. MoDOT only qualified to generate mess, not remediate mess. 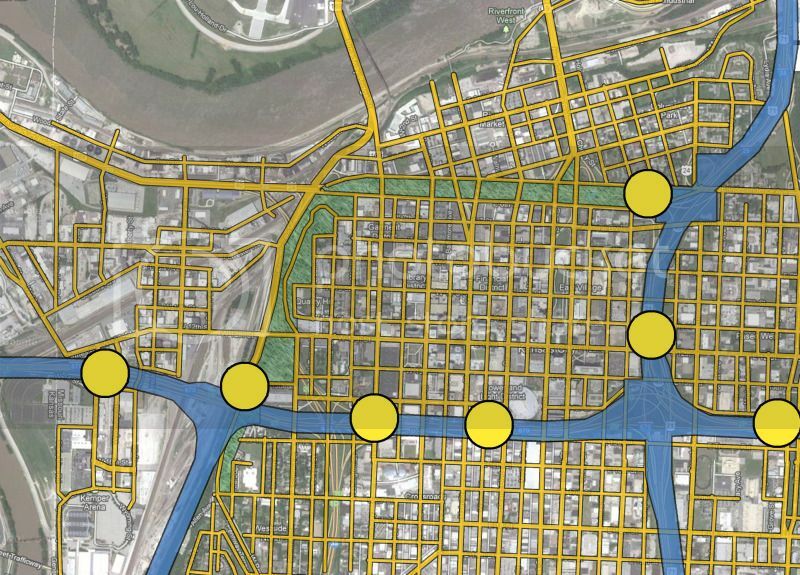 Why don't we just put a lid over the Missouri River like we were going to do with the Downtown Loop? AllThingsKC wrote: Why don't we just put a lid over the Missouri River like we were going to do with the Downtown Loop? Seriously, who put that thing there in the first place? We should just redirect it somewhere else. It really messes with our cities continuity. flyingember wrote: I could see making a deal to not oppose this in exchange for train crossing money. not the perfect situation, but one to take advantage of. Not a bad thought, but coordinating with the railroads will be challenging there. That's probably the second busiest segment of track in KC after Union Station and the geometry is several orders of magnitude more complicated. TBH, I don't see the need for more lanes. There's not that much traffic going to Wheeler or Harlem. 169 going north is only 4 lanes and they just did a ground-up rebuild on the section next to Murray Yard. About all you'd gain with extra lanes on the bridge is extra queuing space for southbound traffic; something that I don't think justifies the cost. The city built the bridge for access to the airport. Toll was collected for many years. Last edited by pash on Thu Feb 09, 2017 6:41 pm, edited 1 time in total. Eon Blue wrote: TBH, I don't see the need for more lanes. There's not that much traffic going to Wheeler or Harlem. 169 going north is only 4 lanes and they just did a ground-up rebuild on the section next to Murray Yard. About all you'd gain with extra lanes on the bridge is extra queuing space for southbound traffic; something that I don't think justifies the cost. there's going to need to be a minimum of a doubling of bridge lanes unless a train can be built to take a large amount of it. The Bond Bridge already has one more lane each direction ready and that's not going to be enough long-term even with transit. I doubt US 169 can be upgraded to 6 lanes in the current spot because of the airport. The question is where the northland can fit the lanes without sending people down other corridors like 635 to JoCo? Or will more people live and work to the north, never venturing downtown? It's worked for College Blvd. KC Could upgrade part of the northland into a business district. After all, with current trends half the council districts will be in the northland, splitting half the city's money along the river. Would have the political base to not need the bridge crossings as much and still grow KC. KC Could upgrade part of the northland into a business district. Years ago that was the plan. More or less it was to be office buildings along I-29 to the airport. This was to be KC's answer to JoCo along I-435. Of cousr part of the plan was built but still much left to do. As northland's populatin builds I expect to see more office building construction. Word on the street is that this is at least ten years away from happening. I doubt US 169 can be upgraded to 6 lanes in the current spot because of the airport. This is all I was referring to--the engineering of this specific situation--not the macroeconomics of projected Northland growth in the next half-century. right, but engineering challenges are surmounted with money when growth means "there's more road needs." Just do this! One big plan! See - Broadway has DIRECT access off the west side of the loop. Local traffic on the FORMER north loop (which is now a boulevard, serving all of downtown's exiting needs) interacts directly with this new Broadway access at an interchange that would be over the west edge of the bluff and away from downtown, essentially west of Washington Street. The only interstates would be the east and south loop, and they would only have a couple of exits - downtown bound traffic from the interstates would be fed into this 'boulevard' which would then move traffic to local streets - Grand, Main, Wyandotte, Broadway, 12th, etc. It makes too much sense. For reference, the blue is the extent of Interstate Highway, I-35/I-70. 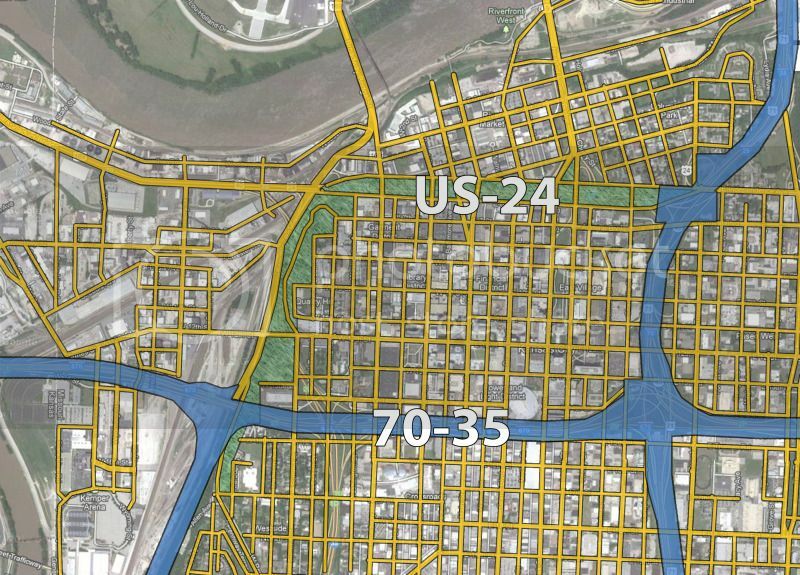 The Lewis & Clark Viaduct and north loop would be the US-24 boulevard, with local access. This could candle the exiting from the freeways for the north side of the loop, without all of the terrible interchanges that exist now. It would also stitch the two parts together. The former west side of the loop would be for direct access to two things - a straight connection to the Broadway Bridge and an interchange or intersection for the US-24 Boulevard. The yellow dots indicate other potential exits.